This is our first year of providing Forest Schools. The children are having a wonderful time and they are learning lots of new skills. They are using our lovely school grounds to explore, build, make as well as experiencing risk taking in a controlled environment. They are taking part in old fashioned, real play with no electrical devises attached only the chance to problem solve, work as a team and discuss solutions to problems. 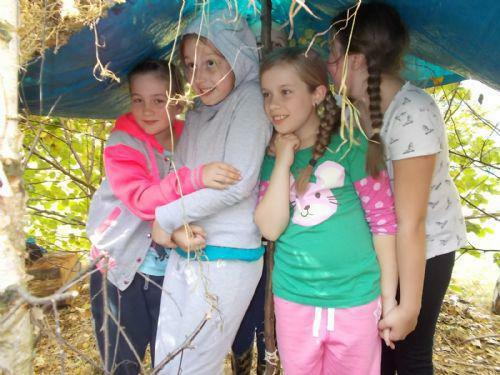 How does Forest Schools support the National Curriculum and your child’s learning? Children explored descriptive vocabulary to describe tree bark and plants. They looked for animal prints, descriptions of imaginary creatures and actual history of the site (bomb craters/swamp plants and animals/pond life etc). All of these sessions used speaking and listening, key literacy skills such as exciting vocabulary and the children then applied their learning from the forest sessions directly to their writing and other topic based literacy. The children investigated: 'Water taking the easiest path'. They explored and solved questions such as:' Why does water behave like this?' and 'What happens when it hits an obstacle?'. Children grew seeds in the mud taken from their boots on their return. They looked at the make-up of the soil by scraping mud off boots and adding water in a vessel, letting it settle and making observations. The children calculated how many insects are in the meadow by looking and counting within a given square area and calculating upward. Children have made craft items or toys from wood and items found around the woods. Children looked at artists’ landscapes and the work of artists such as Andy Goldsworthy and have created their own based on our woodland environment. The Forest Schools curriculum gives all children the opportunities to cut wood and shape it safely using a range of tools. Children also have the opportunity (with safety in mind) for felling and cutting long limbs of the trees, using different tools to achieve a goal and learning new skills. During woodworking sessions children also cover science by explaining the physical forces that are encountered. To learn about the protection of the environment and the world around them. Topics on conservation and recycling materials. 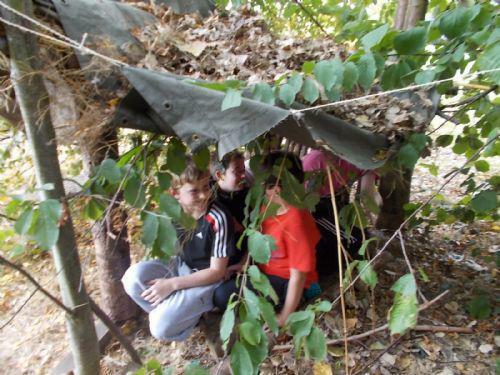 The children will also be carrying out team building activities which promotes self esteem, trust and confidence. Finally, the Year 6 children will have the opportunity of becoming Young Forest School leaders with their prayer partners in Reception in the summer term.